The Autopista C-33 is a highway in Catalonia. 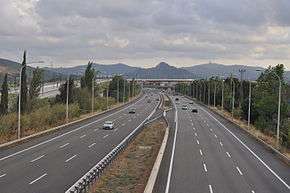 It connects the Autopista AP-7 north of Barcelona to the City Centre and the Autovía C-17. For the 1992 Summer Olympics when the highway was known as A-17, it was used as part of the road team time trial cycling event that started and ended at the Circuit de Catalunya. ↑ 1992 Summer Olympics official report. Volume 2. pp. 305-7. Wikimedia Commons has media related to Autopista C-33.